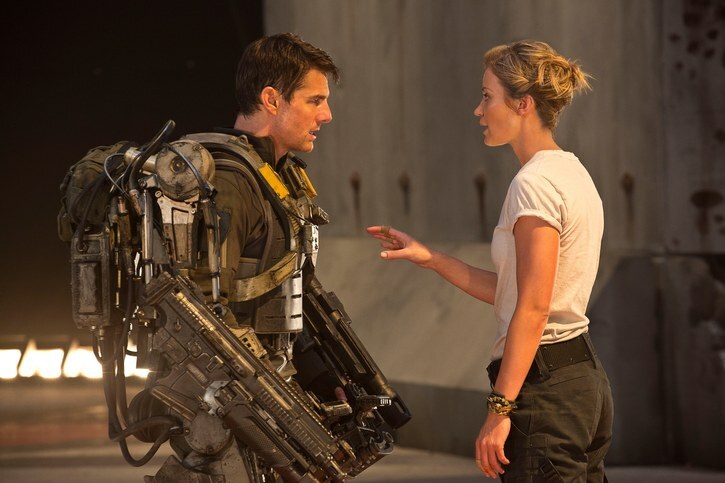 The new Tom Cruise sci-fi action epic Edge Of Tomorrow turned out to be genuinely great surprise. 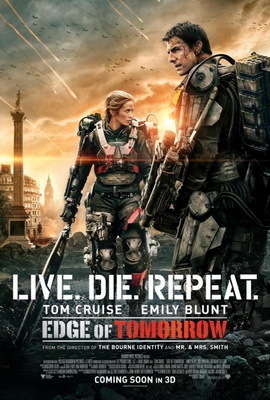 Think Groundhog Day meets Starship Troopers meets HALO and that is what you get with Edge Of Tomorrow. Tom Cruise plays William Cage, a hapless, deskbound soldier who is part of a military campaign to rid Europe from aliens called Mimics that have established a foothold on the continent and are spreading out to the world. Being that he is inexperienced, Cage is killed nearly instantly in a failed invasion of Mimic-held territory. Yet, because he was doused in the aliens’ blood, Cage wakes up the previous morning and relives the day. As the movie progresses Cage goes through the landing on an infinite loop, but each time he dies and is resurrected, Cage gains more combat awareness. This not only makes him a better soldier, but able to decipher how to defeat the Mimics. Edge Of Tomorrow is based on the novel All You Need Is Kill (the film’s original title) by Hiroshi Sakurazaka and is directed by Doug Liman. The director’s expert hand is clearly evident in the film as he keeps each repeated day from becoming tedious to watch. It’s actually kind of fun to see Cage dying from different ways and coming back. At the same time, the action scenes with the aliens are very intense and calls to mind the chaos of other war movies like Starship Troopers, Battle: Los Angeles and even Saving Private Ryan. The mech suits that Cruise and his co-star Emily Blunt wear are kind of goofy looking, but in reality are deadly and formidable weapons and it makes viewers wonder how Starship Troopers might’ve been like if the soldiers in that movie were adorned with mech suits like in Robert Heinlein’s novel. Well, now we have a good idea. An added bonus is that for the most part Tom Cruise does his own stunts and it pays off since it adds intensity and realism to his role. With this and other sci-fi films like Oblivion and Minority Report, Cruise’s presence in them and any future genre film has to be considered as a sign that the film is usually exceptional. As for Emily Blunt, she is definitely a supreme badass warrior woman in this movie and helps carry it. The trailers for Edge Of Tomorrow don’t do the film justice, and makes it seem like another typical, mindless summer action film. But it isn’t. It’s very clever and a real joy ride with fantastic special effects. Sadly, based on expectations and the timing of its release, Edge Of Tomorrow might get lost in the crowded summer movie schedule that already is favoring chick flicks and youth-oriented fare. Regardless of its scheduling and marketing hurdles, sci-fans are in for a mind-blowing treat and should go out of their way to see this extraordinary film.